As Comic Con makes its way to New York, Bandai America has announced its line up of Power Rangers exclusive toys available at the convention. Comic Con exclusives are nothing new to the world of Power Rangers, or any collectible toy line for that matter. Bandai America has announced two new exclusives as well as one re-released toy for distribution at New York Comic Con. The Tokyo Vinyl series has seen simultaneous releases between San Diego Comic Con and New York Comic Con, with the latter being a metallic release or other special edition of the SDCC exclusive. Bandai will be bringing a metallic version of the Mighty Morphin White Ranger Tokyo Vinyl figure to NYCC attendees. The figure is the same as the previously released SDCC 2015 release, but sports a beautiful metallic pearl finish. 500 figures were made for the show, and will be distributed at the Bandai booth in limited quantities each day. The figure will retail for $25. To bounce off the SDCC 2015 Mighty Morphin Dino Charger Power Pack, the Dino Chargers are channeling the power of the Ninjetti as Bandai will be distributing an all new Mighty Morphin Power Rangers the Movie Dino Charger Power Pack at NYCC 2015. This pack features six total Dino Chargers, each cast in a brilliant silver plastic with emblems designed after the Ninja Power Coins from the film. 500 sets were produced in total, and will be distributed at the Bandai booth in limited quantities each day. The set will retail for $30. Finally, Bandai is bringing back the original Legacy Power Morpher as a limited re-release for NYCC 2015. After much fan demand, Bandai is issuing another run of the highly successful toy exclusively for the show. The die-cast Power Morpher includes five die-cast Power Coins, a holster, and of course lights and sounds. While Bandai states the release is limited, no set amount has been announced. The Legacy Power Morpher will retail for $60 at the Bandai booth each day. To follow up on the successful Dino Megazord Charger campaign at Toys R Us locations immediately after SDCC 2015, Bandai is doing it once again as it brings the Ninja Mega Falconzord Dino Charger to Toys R Us stores. 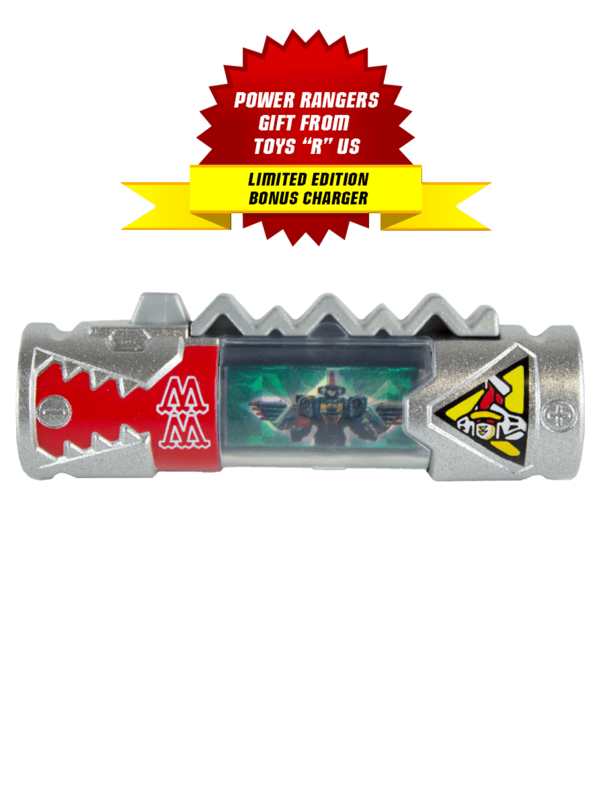 As with the previous campaign, fans who spend $20 or more on Power Rangers merchandise will receive one Dino Charger. The Movie Dino Charger Power Pack will include an empty space in the packaging for this Dino Charger, so it can be displayed with the others. Excited for any of these upcoming exclusives? All items listed above are exclusive to NYCC, and won’t be available in any other capacity. NYCC 2015 kicks off October 8th, 2015 and concludes October 11th, 2015. Bandai will divide up the total amount between each day of the event in effort to give as many attending fans the chance of picking up one of these sought after exclusives.